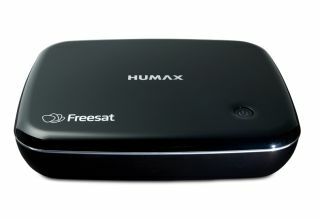 Humax announces new HB-1100S Freesat Smart TV box | What Hi-Fi? Humax has thoroughly breathed on its HB-1000S Freesat set-top box, and the result is this HB-1100S. Under its newly compact, discreet bonnet the HB-1100S is packing wi-fi connectivity, an 8-day-forward/7-day-back EPG and access to on-demand services like BBC iPlayer, ITV Hub, All4 and Demand 5. It's also able to access subscription services like Netflix. There's also access to the Humax TV Portal, allowing users to push photos, videos and music from network-connected devices to their TV. The Humax is compatible with the Freesat App, which allows users to remotely control and plan viewing. Freesat has more than 200 subscription-free channels, with 14 in high definition. The HS-1000 is on sale from mid-April and will cost around £99.